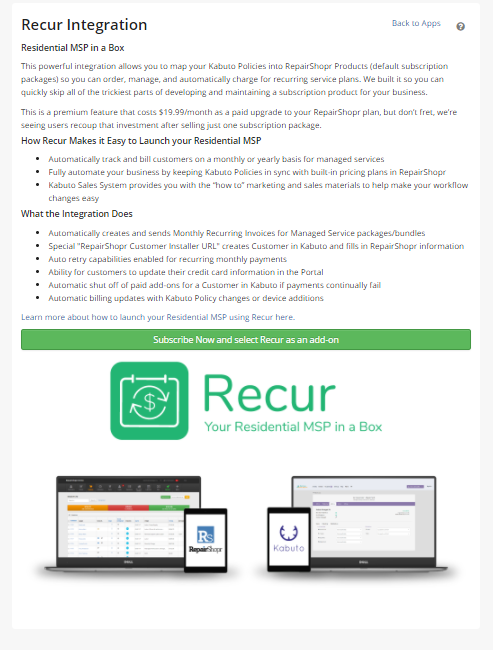 Recur is your "Residential MSP in a Box"
"This enables a whole new business model shift with 100% automation - which is required for this type of business." We made a new embed code & public "Subscribe flow" for you to link to or put on your website that allows customers to see your packages and sign up. This includes everything from adding the customer, setting up the recurring billing, and giving them the right Kabuto installer. 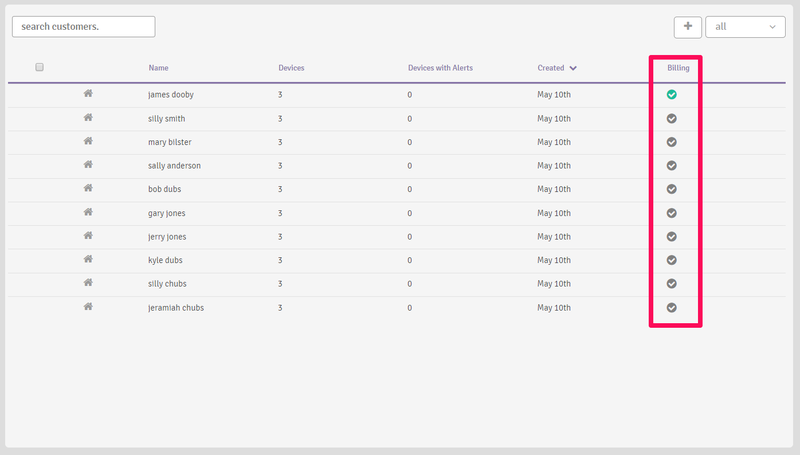 Note: If you are using "Default Customer" as a catchall - you should take the time right now to go through and move those all to real customers or this integration and power just won't work at all. 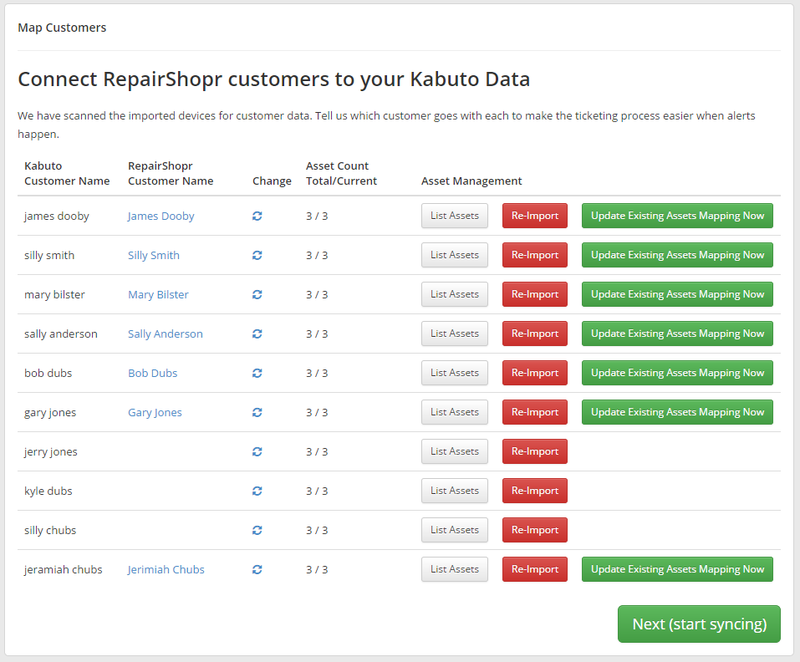 Note: The integration will not create RepairShopr customers from existing Kabuto customers. 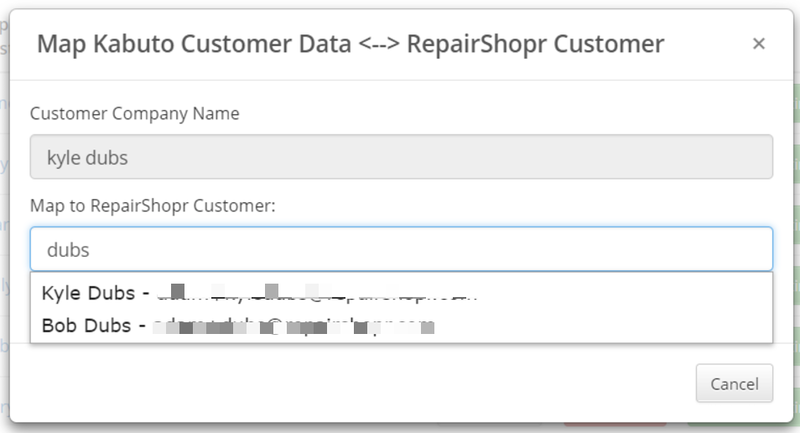 The preferred method of customer creation is initially via RepairShopr, then later bringing them over to Kabuto by using the auto-complete feature in the "New Customer" form on the Kabuto side. 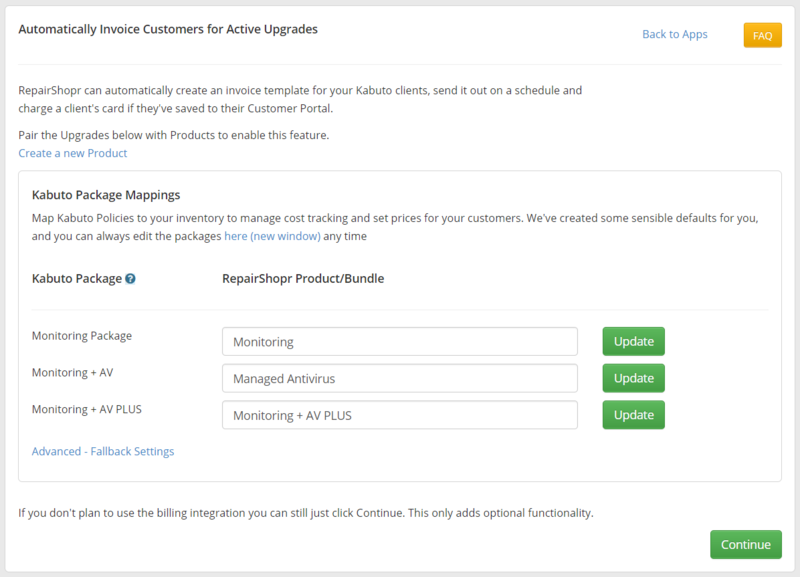 Once you've finished mapping your customers you can click either "Continue to Recur" which will continue on to setting up Recur, or you can click "Finish" which will bring you back to the Kabuto Integration App Card. 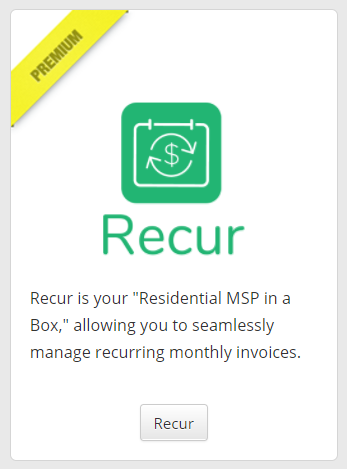 After clicking the Finish button you can get back to Recur by navigating to the Recur App Card. Important Note: These packages and policies must be mapped 1:1, so you cannot reuse an inventory package on more than one policy. This includes Fallbacks. 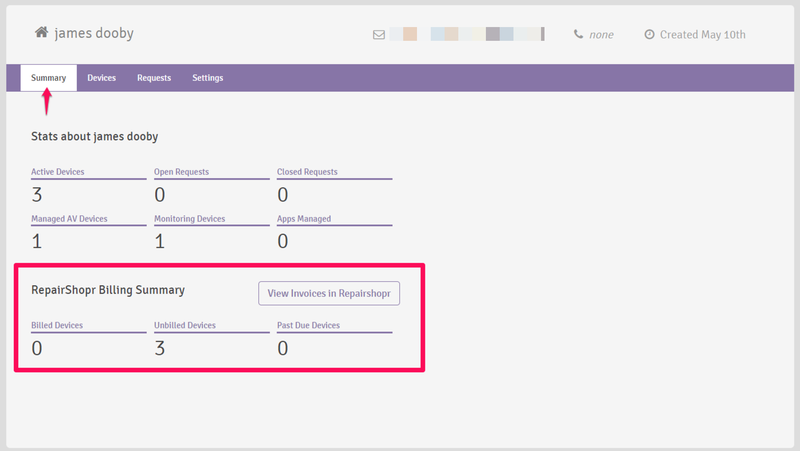 Otherwise, you can get an error on the created invoices showing 0 quantity. 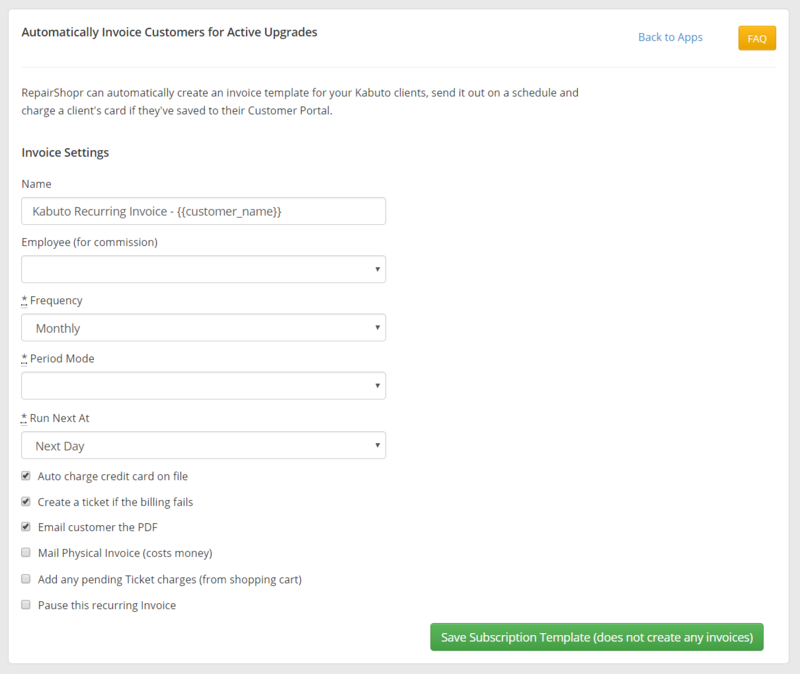 Customer Portal now has a "subscribe flow" where the end customer can sign up for a subscription, add their credit card, and download Kabuto tied to the correct policy - all without you doing anything. New Website embed code and public "Subscribe flow" that can be linked to or embedded in your website for your customers to sign right up without any intervention from you. Quantity is displaying as 0 on the created invoice. - Please make sure that you pacakages and policies are mapped 1:1. This includes fallbacks. Otherwise, Recur will be uncertain which package to bill the customer. 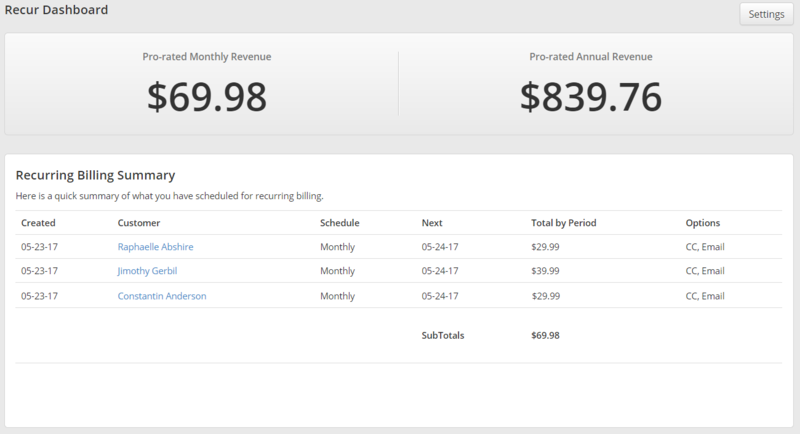 - You can double check to make sure the invoice is created properly by using the "Recalculate Quantity" buttons on the recurring invoice. 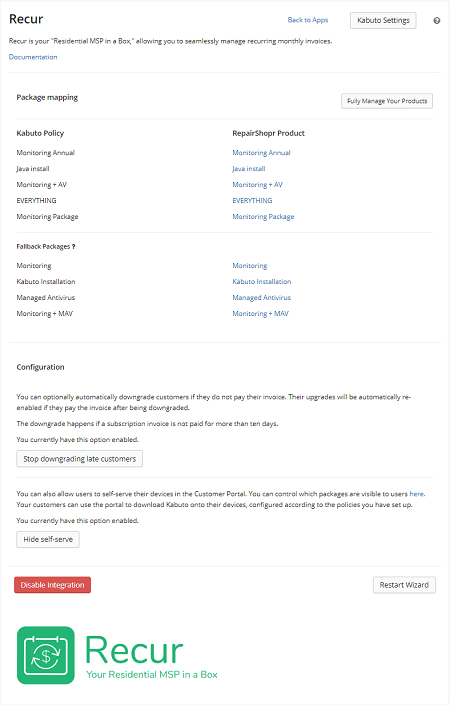 Deleted policies in Kabuto displaying in Recur and RepairShopr. 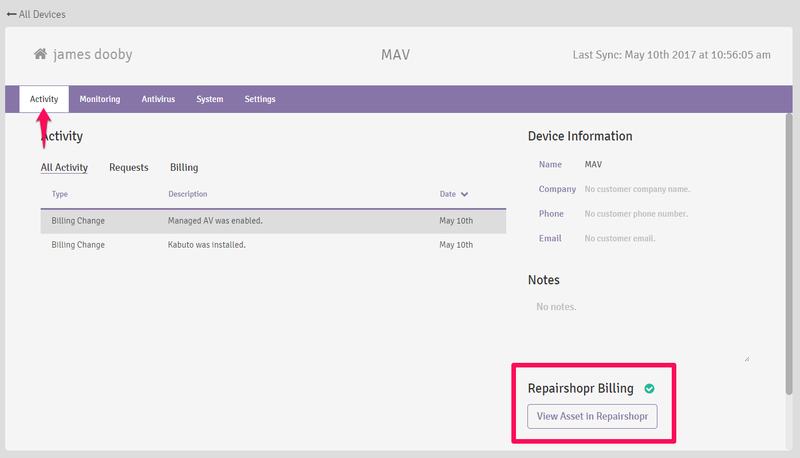 - You can remove and add policies into Recur and RepairShopr by disabling both the Kabuto and Recur integrations. Then start the Kabuto Integration, and then the Recur integration wizards. - If you do not disable both integrations and enable them one at a time, this can cause issues with mapping packages and policies together, so please disable both before re-enabling/restarting the wizard.